Lukas Gruenert is an aspiring researcher who came into the ENF/CHORI program subsequent to a gap year from Oberlin College during which he worked in his father's lab at University of California at San Francisco. Lukas researched the use of gene editing techniques, Small-Fragment Homologous Replacement (SFHR) and CRISPR/Cas9, to modify endogenous DNA. His objective in this research was to demonstrate the versatility and efficacy of SFHR and CRISPER/Cas9 as gene editing tools for a viable and consistent therapy for CF and other genetic disorders. CRISPRs are tools used by researchers to stimulate DNA repair at specific regions in genomic DNA. They can be customized to target virtually any location in human genomic DNA which is particularly helpful in CF since it can be caused by a variety of different genetic mutations. 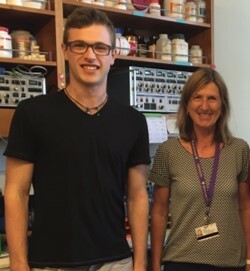 For his summer project Lukas used CRISPRs to target a single, rare CF mutation: G542X. His preliminary results achieved measurable modification as desired, and lay the foundation for future research which aims to ratify results, make improvements, and insure consistency. function in CF Patient-derived airway epithelial cells with common and rare mutations. Ped. Pulmonol. 51, suppl. 40, 198-199. Illek B, Fischer HB, Bustillo ME, Meiss L, Juarez L, Gruenert DC, (2013) . Heat Shock Enhances CMV promoter-driven CFTR Expression in CF airways. Ped. Pulmonol. 48, suppl. 35, 230. Sellers ZM, Illek B, Figueria M, Hari G, Joo NS, Sibley E, Fischer H, Wine JJ (2015) PGE2-stimulated Cl- secretion and mucociliary clearance in cystic fibrosis airway. Ped. Pulmonol. 50, suppl. 39, 236. Fischer H, Echavia K, Finkbeiner W, Illek B (2015). Growth inhibition of P. aeruginosa by an alkaline airway pH in a bacterial-epithelial coculture system. Ped. Pulmonol. 50, suppl. 39, 238. Illek B, Zlock L, Boecking C, Olshansky S, Echavia K, Gopika H, Pangilinan E, Finkbeiner WE, Fischer H (2015) Conditionally reprogrammed cells for personalized medicine in cystic fibrosis. Ped. Pulmonol. 50, suppl 39, 256-257. Illek B, Meiss L, Modlin S, Cohen F, Gruenert DC, Fischer H (2010). Hyperactivation and protection of CFTR Cl transport by brief hyperthermic treatment. Ped. Pulmonol. 45, suppl 33, 257. Illek B, Bustillo ME; Spence, S, Fischer H, Gruenert D (2011) Enhancement of CFTR correction by brief hyperthermic treatment and DNA methyltransferase inhibitor. Ped. Pulmonol. 46, suppl 34, 232. Lauren Meiss, Role of CFTR and p53 during Pseudomonas Aeruginosa Homoserine Lactone-Induced Apoptosis and Epithelial Barrier Breakdown. Honor Thesis. Arizona State University. lllek B, Meiss L, Modlin S, Cohen F, Gruenert D, Howard M, Fischer H (2009) Heat shock response protects against pyocyanin-induced loss of CFTR function in bronchial epithelial cells. Free Rad Biol Med., 47 suppl 1, S101. lllek B, Fischer H, Streich-Tilles T, Cheng A, Ames BN, Jiang Q, Peden DB (2007) Duox1-mediated release of hydrogen peroxide is modified by vitamin C. Am J Respir. Crit. Care Med., A126. Fischer H, Streich-Tilles T, Illek B (2008) Expression and Function of the HVCN1 proton channel in airways. (2008). Ped. Pulmonol., suppl 31, 244. Illek, B, Suh, JH, Kim E, Barber KJ, Fischer H, Gruenert D, Schwarzer C, Machen TE (2008) Oxidative stress by pyocyanin inhibits Cl- transport in wildtype CFTR corrected cystic fibrosis bronchial epithelial cells. Ped. Pulmonol., suppl 31,228, 322. Schwarzer C , Fischer H, Kim EJ, Barber KJ, Mills AD, Kurth MJ, Gruenert DC, Suh JH, Machen TE, Illek B (2008) Oxidative Stress caused by pyocyanin impairs CFTR Cl- Transport In Human Bronchial Epithelial Cells. Free Radical Biology & Medicine. 45(12): 1653-62. Maurisse R, Illek B, Cheung J, Wahler L, Fischer H, Gruenert DC (2006) Episomal expression of the entire 6.2kb CFTR cDNA corrects defective Cl secretion across polarized cystic fibrosis airways. Ped. Pulmonol., suppl. 29, 290. Illek B, Maurisse R, Fischer H, Wahler L, Gruenert DC (2007). Enhanced ATP-stimulated Cl secretion after complementation of CF airway epithelia cells with WT-CFTR. Ped. Pulmonol., suppl.30, 250. Illek B, Maurisse R, Wahler L, Kunzelmann K, Fischer H, Gruenert DC (2008) Cl- Transport in Complemented CF Bronchial Epithelial Cells Correlates with CFTR mRNA Expression Levels. J. Cellular Physiol. Biochem. 22:57-68.